An end-of-one-year, start-of-the-next message from Dr. Katherine I. Pettus, PhD, IAHPC Advocacy Officer. Thank you for all your help and support this year, to IAHPC in general, and to the advocacy program in particular. Palliative care is a team sport, and we could not have done it without you. This month’s Newsletter showcases the fabulous work IAHPC is doing with partners around the world to advance our core mission or to alleviate suffering wherever possible. (Clockwise, starting top left) With the Asociación Salvadoreña para el estudio, tratamiento del dolor y cuidados paliativos and Deans of medical and nursing schools in San Salvador, El Salvador; with Giovanna Abbiati, Fondazione Maruzza, at the 68th Session of the WHO Europe Meeting in Rome; with Dr. Sébastien Moine, Gulnara Kunirova, and Dr. Santiago Correa, at the Global Primary HealthCare Conference, Astana, Kazakhstan; and with UCLA Global Health graduate students (Pamela Secada, Jennifer Parratt, and Nicholas Gerken) and Dr. Natalia Arias Casais (Atlantes Project) at the World Health Assembly in Geneva. You are an integral part of that mission. Looking back over the year, I think that we can be proud of our efforts in the international arena that I hope are inspiring and supporting your efforts at the regional and national levels. Most of these actions are documented, with hotlinks to key speeches and articles, on our website’s Advocacy Page. Please have your Association make a New Year’s resolution to identify at least one member to apply for our free basic advocacy training course, a webinar available to all IAHPC members in the summer of 2019. Ensuring that key World Health Organization (WHO) political documents and technical reports — such as the Declaration of Astana, the WHO 13th General Program of Work (GPW13), and the Montevideo Roadmap — include the words ‘palliative care,’ and reference the need to improve access to controlled medicines. Attending key meetings of the international working group of palliative care experts at the Vatican, and co-authoring the PAL-LIFE White Paper for Global Palliative Care Advocacy. Participating in the Open-ended Working Group on Ageing at the United Nations, in particular the sessions on palliative care that are now included in all documents and reports of countries attending the OEWGA. Each issue of our 2018 newsletter contains reports of accomplishments and challenges from around the world. It’s worth browsing past issues. Support our members to build relationships with key contacts in their ministries of health, justice, drug control, education, and finance to inform them of palliative care services and needs in their countries, and to influence positions at the World Health Organization and Commission on Narcotic Drugs. Deliver an advocacy course to our members and develop a national/regional/international program to support them. 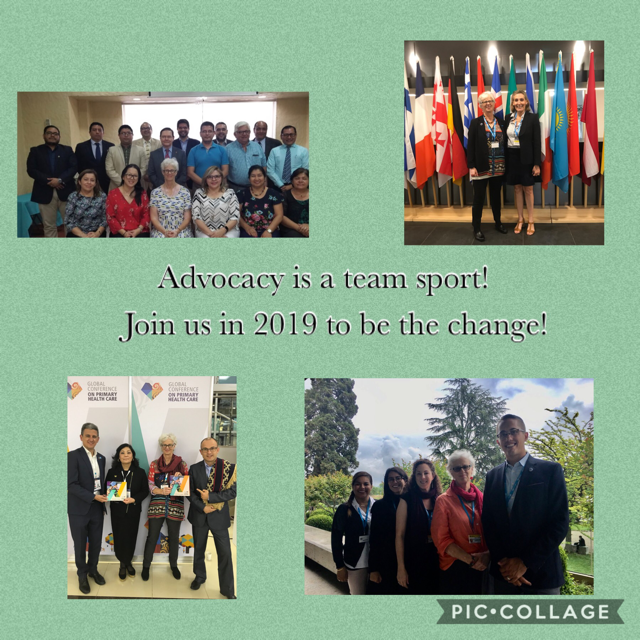 FYI: You can consult our Advocacy Note for the WHO Executive Board Meeting in January 2019. Thank you to all of our partners and collaborators whose hard work and good spirits keep the vision of palliative care for all alive every day. A collaborative and supportive ethos is the key to our current and future success. May 2019 be a year to build on, and learn from, the accomplishments and challenges of 2018! Do you have any comments or questions about this piece or our advocacy program?